A door here, a handle there, a handshake now and again, and then a coffee to go? We touch a lot of things when out and about and travelling—and germs spread particularly quickly via the hands. 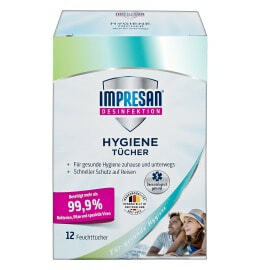 With IMPRESAN products in handy travel sizes, you can reliably disinfect hands and objects when on the go. Enjoy being out and about without having to worry about germs!